If you love chewy, thick-cut bacon but have a hard time cooking it on the stove, bake it in the oven! To make classic thick-cut bacon, lay the strips on a foil-lined sheet and bake them until they're crisped. For a sweet and smoky flavor, use smoked bacon and brush it with maple syrup a few minutes before it's finished baking. You can make decadent thick-cut bacon by topping it with a brown sugar pecan mixture that will cook on top of the bacon as the strips become golden brown. 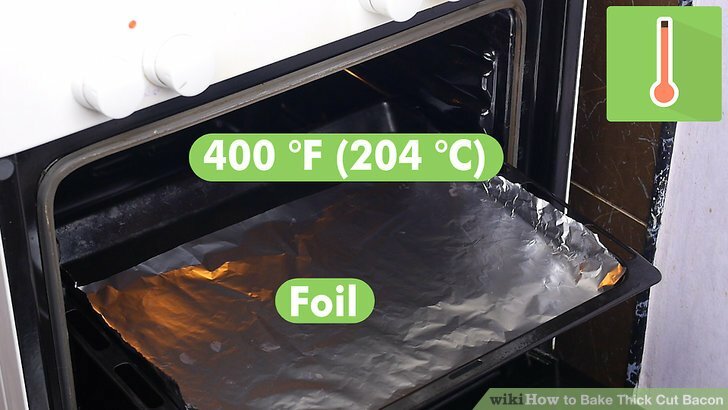 Preheat the oven to and line a sheet with foil. Use a large, rimmed baking sheet to catch the grease. Lining the bottom and sides of the sheet with aluminum foil will make clean up easier. Lay the bacon in a single layer on the foil. Get out 1 pound (453 g) of thick-cut bacon and lay the strips in a single layer on the foil. The strips can touch each other, but avoid overlapping them or they won't cook evenly. If you want crispier bacon, set a baking rack on the foil-lined sheet. Arrange the bacon on the rack, so air circulates under the bacon as it cooks. Bake the thick-cut bacon for 10 minutes. Put the sheet in the preheated oven and cook the bacon for 10 minutes before you check it. Depending on how thick the bacon is and how chewy you like your bacon, it could be finished after 10 minutes. Cook the bacon for another 10 minutes, if desired. If you want your bacon to crisp up more, continue to cook it for another 10 minutes before you check it again. You don't need to flip the bacon. Transfer the bacon to a plate and serve it. Lay a few paper towels on a plate or platter and wear oven mitts to take the sheet of bacon out of the oven. Use tongs to transfer the bacon to the plate. The paper towels will absorb excess grease. Serve the bacon immediately. 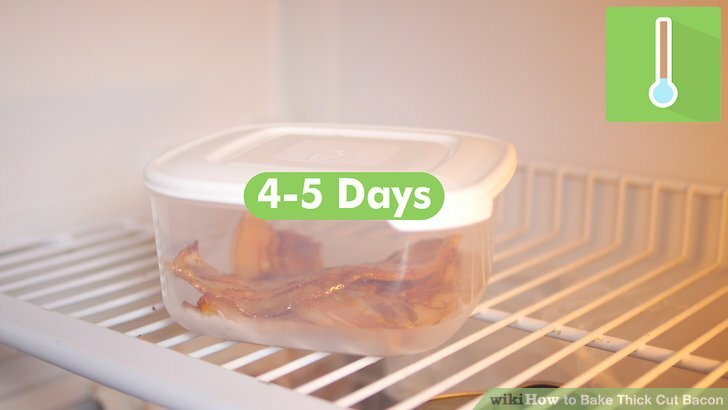 Store leftover bacon for 4 to 5 days in the refrigerator. Place the bacon in an airtight container. You can use the bacon while it's cold, keeping in mind that the bacon will lose its crispiness as it's stored. To reheat the bacon, heat the bacon in a s****et over medium heat until the bacon is heated through. You can also reheat the bacon in the microwave. Set the bacon on a microwave-safe plate and heat the bacon in 20-second increments until it's heated through. Preheat the oven to and lay foil on a baking sheet. 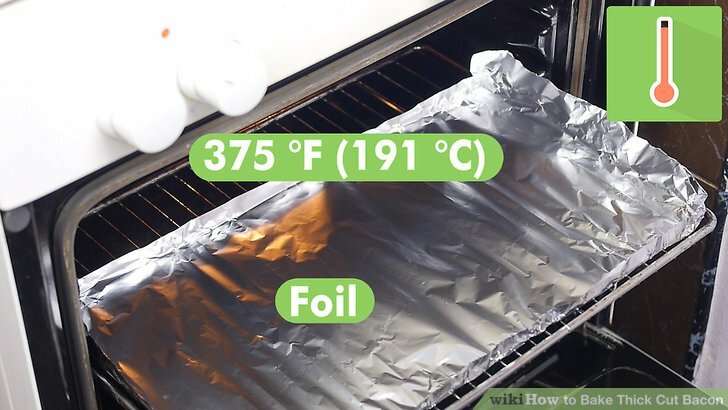 Cover the sides and bottom of a rimmed baking sheet with aluminum foil. If you don't have aluminum foil, you can use parchment paper. Set a baking rack on the sheet. Lay the bacon on the rack. Arrange 3/4 pound (340 g) of thick-cut smoked bacon on the rack so the slices aren't touching. Cook the bacon for 15 to 20 minutes. Put the sheet in the preheated oven and cook the bacon until it starts to turn brown and crispy around the edges. Brush the bacon with maple syrup. Pour 1 to 2 tablespoons (15 to 30 ml) of maple syrup into a small prep bowl. Put on oven mitts and use them to take the baking sheet out of the oven. Dip a pastry or barbecue brush in the maple syrup and spread it over each slice of bacon. For the best result, use real maple syrup (not pancake syrup) for this recipe. Use caution when handling the sheet because there will be hot grease under the baking rack. Cook the bacon for 3 to 5 minutes. Put the sheet back in the oven and cook it until the bacon is completely browned and crispy. Serve the bacon. Remove the sheet from the oven and lay paper towels on a serving platter. Use tongs to transfer the bacon from the rack to the paper-towel lined platter and serve the slices immediately. 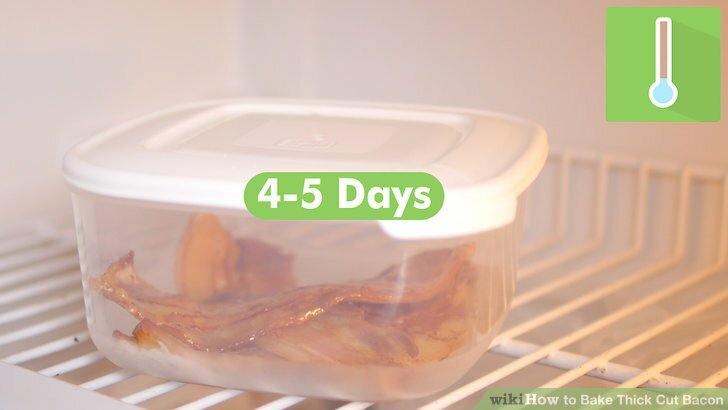 Refrigerate leftover bacon for 4 to 5 days. Put the bacon in an airtight container. If you like, use the bacon while it's cold, keeping in mind that the bacon will lose its crispiness as it's stored. You can also reheat the bacon by heating it in a s****et over medium heat until the bacon is heated through. Preheat the oven to and line a sheet with parchment paper. If you don't have parchment paper, you could use aluminum foil. Ensure that the bottom and sides of the rimmed baking sheet are covered. Arrange the bacon on a rack on top of a parchment paper-lined sheet. Set a baking rack on the foil-lined sheet. Take 8 slices of thick-cut bacon and lay them on the baking rack so there's at least 1 inch (2.5 cm) of space between them. The rack will allow air to circulate under the bacon, so it becomes crispy. Cook the bacon for 15 minutes. Put the baking sheet with bacon in the preheated oven. Cook the bacon until it begins to crisp a little at the edges, but hasn't finished cooking in the center. This should take 15 minutes. Mix the pecans, brown sugar, maple syrup, and cayenne. Get out a small bowl and put 1/2 cup (65 g) of finely chopped pecans into it. Stir in 1/2 cup (100 g) of brown sugar, 1/4 cup (60 ml) of maple syrup, and 1/4 teaspoon (0.5 g) of cayenne powder. The mixture should be sandy. Spread the praline mixture over the bacon. Remove the sheet of bacon from the oven and divide the praline mixture evenly among the strips. Use a spoon to spread the mixture across each strip. Bake the maple praline bacon for 8 to 10 minutes. Return the sheet to the oven and cook the bacon until it's completely baked and the topping becomes crispy. This should take 8 to 10 minutes. Serve the bacon or let it cool. Transfer the maple praline bacon to a platter and serve it immediately. If you'd like the praline to harden, let it cool completely or refrigerate it before serving. 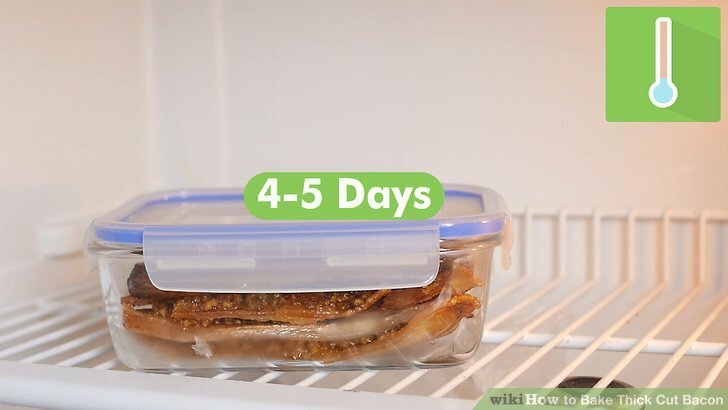 Refrigerate the leftover bacon for 4 to 5 days. Put the bacon in an airtight container. Use the bacon while it's still cold. You won't be able to reheat the bacon because the praline will liquefy and run off of the bacon.